Engravable drinkware is extremely versatile. It can be used by a company to promote business, or it can be a unique gift idea for aquaintances and loved ones alike. Since various fonts and images can be applied, each item presents a completely custom appearance. As such, you’ll be able to find the perfect type of drinkware to fit your recipient’s personality! Below is a quick guide to four of our most popular types of engravable drinkware, and the sort of person who would be the perfect recipient. The gift: Most people travel to work or run errands with coffee in hand. Travel mugs are made to resist spills and keep a beverage at an optimum temperature, and they often slip seamlessly into the morning ritual of the average coffee drinker. When at travel mug is engraved with a person's name or a special message, it becomes a keepsake and a daily reminder of your appreciation. Perfect for: Personal and warm without violating any boundaries, travel mugs make a wonderful “thank you” gift for someone you know and like but wouldn’t consider an intimate friend. A great teacher, an extra-helpful doctor or nurse, or a worthy employee or boss would love this gift. If you know for a fact that your recipient is a coffee addict (and let’s be honest, the odds are good that they are) then slip a Starbuck’s gift card into the mug as an extra surprise. The gift: Remaining properly hydrated benefits overall health. This is why many people adopt the habit of carrying water bottles with them wherever they go. Although water bottles are available in numerous materials, stainless steel is one of the most durable, lasting options. Unlike plastic, stainless steel keeps inside liquids warm or cold without affecting the temperature outside of the bottle. Stainless steel is a substance that has no effect on the taste of the drink and contains no chemicals that leech into the beverage. Perfect for: Stainless steel water bottles might just be the best “all-around” drinkware gift we offer, due to the universal usefulness and popularity of the water bottle. However, the personalized water bottle makes an extra thoughtful gift if your recipient is a cyclist, an outdoor enthusiast, or an environmentalist. Customize it further by filling it with trail mix or another hearty outdoor snack! 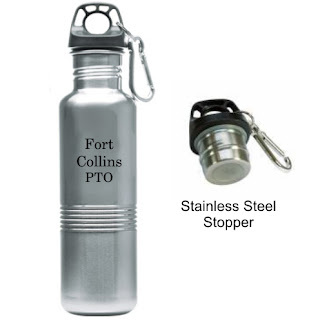 Personalized stainless water bottles also work well as business promotions. Place your company logo on the bottle and give them away for some smart, instant advertising. The gift: Stemmed wine glasses are an elegant way to serve drinks at home. When engraved with names, dates, or messages, they level up to become a refined, memorable gift. 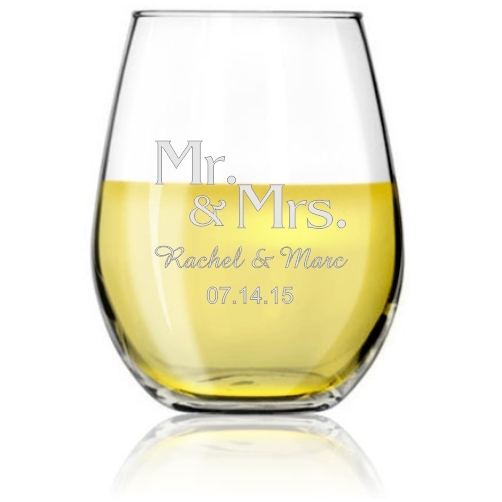 Perfect for: Because of their association with wine and sophistication, engraved wine glasses aren’t as casual as a travel mug or water bottle. They function best as a gift for people you know well, like close friends, family members, or a romantic partner. 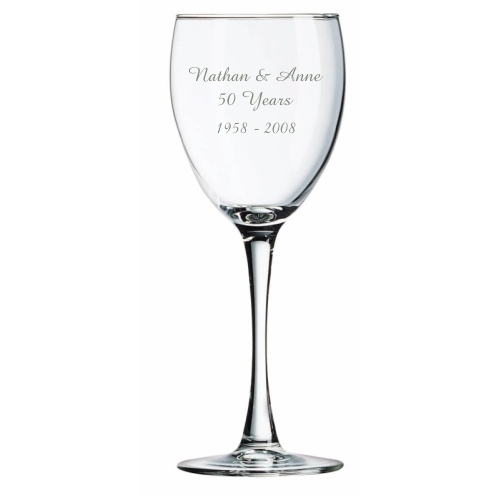 Because you can engrave them with significant names and dates, personalized wine glasses also make a wonderful anniversary or wedding gift. Pair them with a bottle of fine wine to complete the unique, thoughtful gift. The gift: Stemless wine glasses are trendy spin-offs of traditional stemmed glasses. Besides holding alcohol, they can be used as everyday juice or water drinkware, and they even function as gorgeous candle-holders. Since they are easily stacked, they take up less space in cupboards than their stemmed counterparts. Think of them as the formal stemmed wine glasses’ cute, casual little sister. Perfect for: Personalized stemless wine glasses make elegant house warming gifts, especially for people who tend to drink beverages other than wine. True wine purists may still prefer stems to prevent hand warmth from penetrating the wine and changing its taste. However, stemless glasses reflect today's casual entertaining style and are much more functional. They’re great for that person in your life who loves and appreciates beauty but prefers friendly gatherings to formal events. Engravable drinkware provides limitless gift and promotional opportunities. For a complete selection of items, visit Engravables Plus. There is sure to be something for everyone!